Legacy.com is pleased to announce that we’ve been honored with an EPPY Award, naming us 2012’s Best Classified Website. 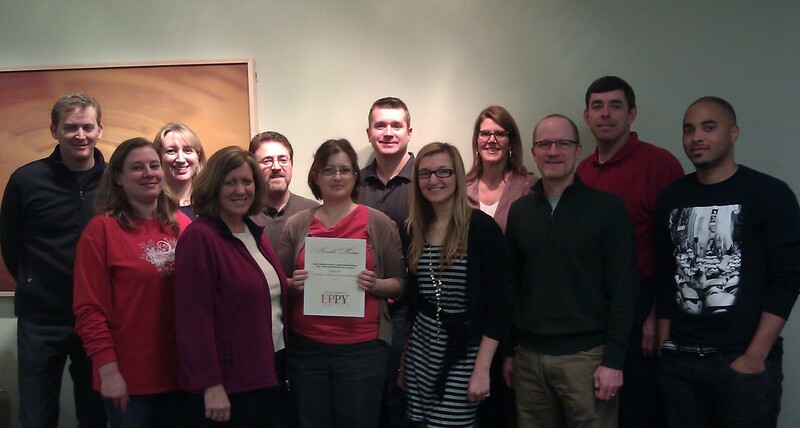 Our Eppy Award, along with just a few of the folks who make up the Legacy.com team. What is an EPPY? The EPPY Awards are presented by Editor & Publisher magazine, the longstanding authority on the newspaper industry. Annually for the past 17 years, they‘ve awarded EPPYs to media websites both big and small in 31 diverse categories. 2012 isn’t the first year Legacy.com has won; we were honored with the same award two years ago. And for the third year in a row, Legacy.com has received an honorable mention in the Best Community Service category for our grief support network, LegacyConnect. We are proud to accept these awards from Editor & Publisher because they emphasize the importance of what we do here at Legacy.com – for our newspaper partners and for our site users who look to us as the leader in online obituaries and as a vital resource in times of loss. Legacy.com remains committed to helping people remember a life well lived. On behalf of Legacy.com, we thank Editor & Publisher, our partners, site visitors, and all the members of the Legacy team. Thank you! This entry was posted in In the News, Life at Legacy.com and tagged Life at Legacy.com. Bookmark the permalink.